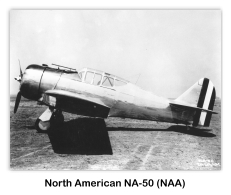 The North American NA-50 was developed by North American Aviation as a simple single seat, low-wing, single engine fighter for export. 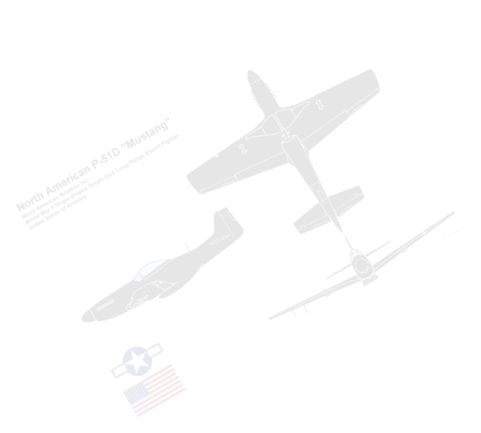 The design was developed from the NA-16/BT-9 basic training aircraft of 1935. 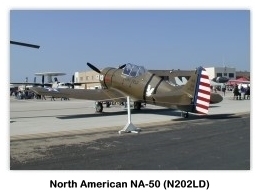 The NA-16 evolved into a series of aircraft that were some of the most widely used advanced and basic training aircraft produced by any country and provided the basic design for a single engine fighter intended for small countries that needed a simple aircraft with modern capabilities and features. 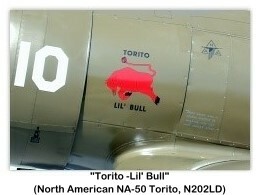 Peru purchased seven of the North American NA-50 “Torito” (Spanish slang for "little bull") single-seat fighters, factory serial numbers 50-948 to 50-954. Powered by a 840-hp Wright R-1280-77 Cyclone engine, the Peruvian single-seater marked North American Aviation's entry into fighter design. 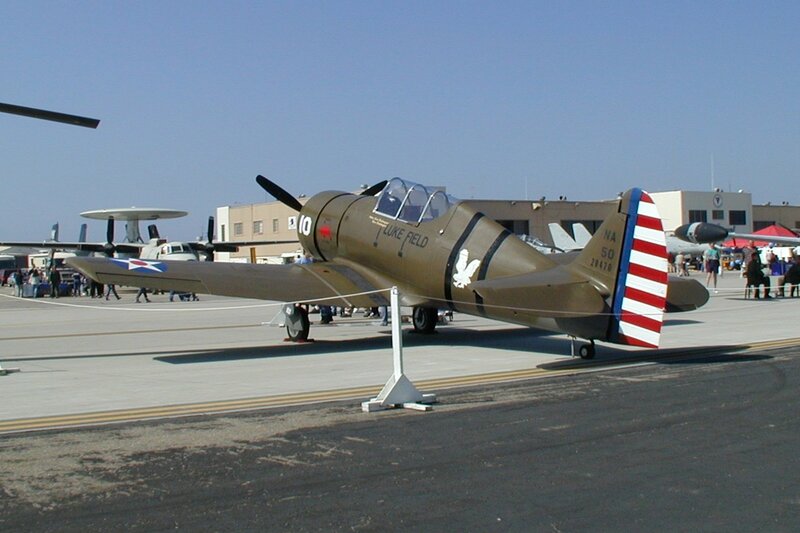 Based on the North American BC-1, the concept was the ideal answer to the need by smaller nations for a lower-cost fighter. The wingspan was shortened to 37 ft 4 in, the sweepBack was reduced and the tips squared The fuselage structure was strengthened to accommodate the 840-hp Wright radial air-cooled engine with a 3-blade propeller. The armament consisted of two cowl-mounted 0.30-in (7.62 mm) Browning M12919 machine guns, two 0.30's in the wings and underwing racks for dive bombing. North American Aviation pilot Paul Balfour made the first flight on 1 August 1938, and the final acceptance was on 15 April 1939. Peruvian pilots ferried the first three planes to South America and the other four were crated and shipped by boat. The Peruvian NA-50's took part in the Ecuadorian-Peruvian war of July 1941, supporting Army of Peru ground forces. 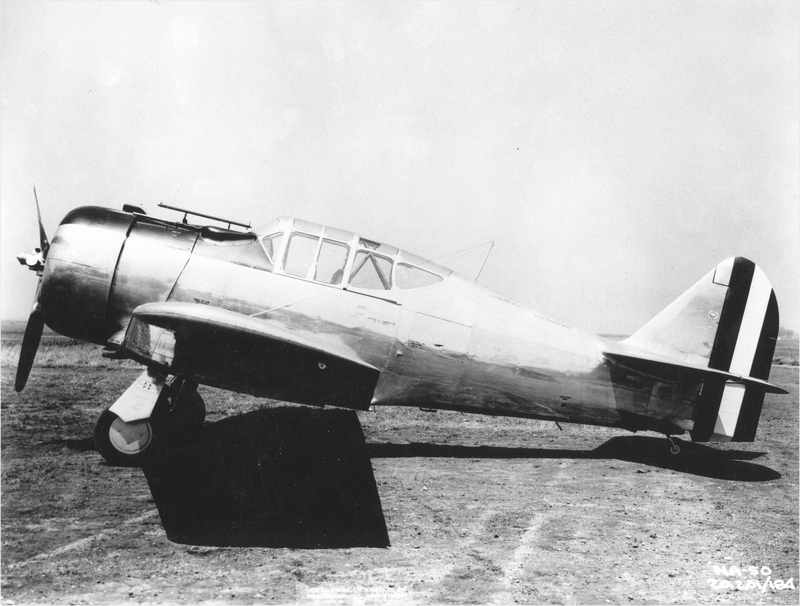 NA-50 XXI-41-3 (c/n 50-950). One of the original seven NA-50's built is displayed on a pedestal in front of the Museo Aeronáutico del Perú at Las Palmas Air Base, Lima, Peru, and next to the Mausoleum of Captain José Quiñones Gonzáles, (a Peruvian national hero who died while flying an NA-50). 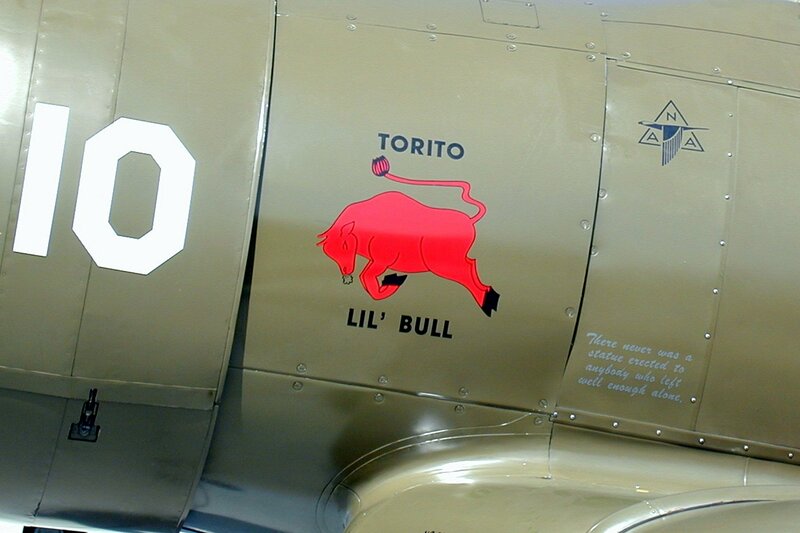 This example was initially assigned to Escuadrón de Aviación No.1 (Chiclayo Field) and was later transferred to the 28th Advanced Fighter Training Group, 4th squadron until retired in 1967. 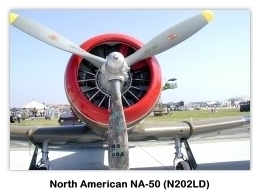 A replica of the NA-50 was built from a Canadian Harvard and is currently airworthy. Wings in five sections, two-spar center-section, two removable single-spar outer sections and two detachable wing-tips. Spars and ribs of aluminum-alloy with smooth stressed skin. Balanced and differentially-controlled ailerons have aluminum-alloy frames and fabric covering. Forward section is of welded chrome-molybdenum steel-tubing with removable side panels. Rear section of semi-monocoque metal alloy construction. Suitable inspection doors are provided in rear section. Fixed surfaces are metal-covered in non-adjustable. Elevator and rudder are fabric-covered, balanced and fitted with adjustable trimming-tabs. Retractable cantilever single-leg half-fork type. Hydraulically-operated differential brakes and parking brake. Wheel-type skis may be installed. 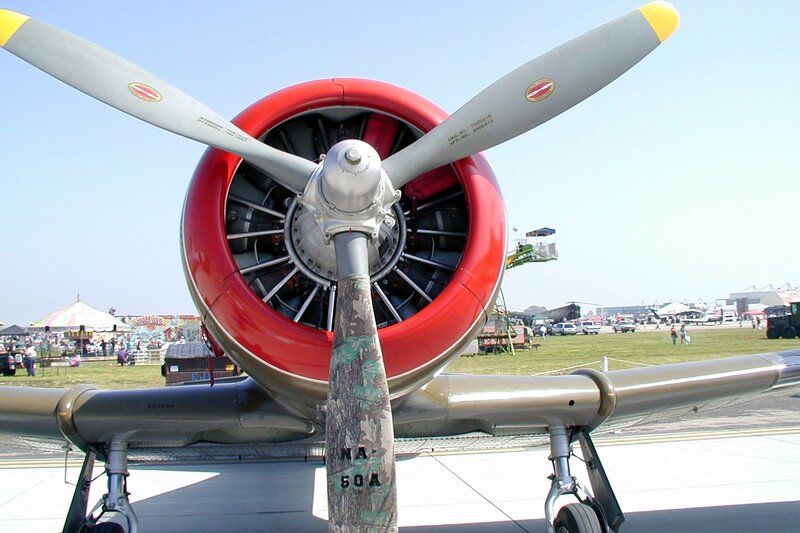 Steerable tail-wheel with full 360° swivel. One Wright "Cyclone" GR-1820-G203 or three GR-1820-203A radial air-cooled engine on welded steel-tube mounting. Two fuel tanks in center-section (170 US gallons capacity). Oil tank (15.5 US gallons) on top of engine-mounting. Alternatively, the Wight "Cyclone" R-1820-F53 direct-drive or geared R-1820-G3 engines may be used. Pilot's cockpit over wing with sliding and closure. Windshield of Plexiglas, side panels of shatter-proof glass. Baggage space in rear monocoque section. Provision is made for installation of 114 lb (51.71 kg) of radio equipment. Two synchronized Colt 0.30-cal or 7.67 mm machine guns. North American flush-type bomb-racks in outboard wing-sections.